The village is located close to the Liptovská Mara dam and the town of Liptovský Mikuláš. There is a wooden articular church, one of the largest wooden churches in Europe. It originated in the village of Paludza, which was flooded during the construction of the dam (1974 – 1982). The first evangelical church in Paludza was built in 1693, after the Šopron assembly. 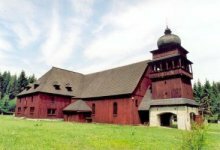 Eighty-two articles were accepted at the meeting and the emperor Leopold allowed Protestants to build wooden churches, which had to be placed outside the village. The church was later rebuilt by the master Jozef Lang without any project (he was unable to read and write). The reconstruction took 8 months and it was finished in 1774. The church tower was build in 1781 and new bells were mounted in 1921 and 1922. The church equipment includes an baroque altar, pulpit, stone font, biblical paintings, chandeliers made of Venetian glass and an organ. The capacity of the church is 6000.